Best of Missouri Hands Silver Dollar City liaison, Sam Davisson shared...Best Of Missouri Hands juried artist Julie Ann Hume was awarded the Craftsman of the year award. at Silver Dollar City , in Branson MO.….CONGRATULATIONS! If you know my momma..Julie Ann Hume, then you know she has been an artist all of her life. She’s worked in several mediums and many have been with my father and his incredible wood working. 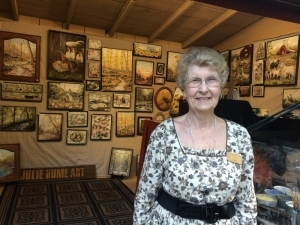 On October 25, 2018 after many years at Silver Dollar City’s Fall Arts and Crafts Festival, she won the Craftsman of the year award. There are literally hundreds of over the top craftsmen and women showcasing there talents. I am so unbelievably proud of her winning this award.